Thuja Green Giant is deservedly popular. Fast-growing, drought and salt-spray resistant, generally avoided by deer and free of pests – what more can we ask of an evergreen? You may be planting a screen, or a more formal hedge, or using it as upright specimens around the garden. Whatever your need, its easy to see why this plant remains consistently popular across a large swathe of the country. Good results though, come from good beginnings, and with Thuja Green Giant – and of course with most plants – that good beginning is the planting procedure. If you are new to plants, or indeed if you have some experience but could always learn more, let’s look at the steps and stages of planting, so that your trees get off to the best possible start. Even the best plant can only grow as well as the soil it is in. While it is probably possible in many gardens to just stick it in the ground and walk away, the best results – especially rapid growth and good establishment – depend on planting into prepared soil. There is no particular secret to good soil preparation, and no matter what type of soil you have, the key steps are digging and enrichment. In a natural soil nutrients and finer particles are carried downwards by drainage water, so that the upper layers have fewer nutrients than lower down. Just as in farming, digging and turning the soil is a vital first step in improving the quality of your soil. For smaller areas, or just to plant one or two trees, hand digging with a spade will do a great job in a reasonable time. For a larger area, renting or borrowing a roto-tiller will save a lot of work. Get the biggest machine you can handle, and that will fit into the area you are working with. The biggest issue with using roto-tillers is to get the necessary depth. The soil needs preparing up to 12 inches deep, or at least to the depth of a full-sized spade, and a roto-tiller can easily skip across the surface, making the area look great – until you discover that it has only gone down a couple of inches. The trick is to go over the area a couple of times at least, until it buries itself as deep into the ground as it can go. Then you know you have done the job. Find a source of rich organic material. This could be garden compost, rotted farm manure (cow, sheep or horse), spend compost from a mushroom farm, well-rotted leaves, or perhaps some other local alternative. Although peat moss has been widely used in the past, it isn’t really a top choice, and the environmental damage done by harvesting peat is another negative – but if it is all you can find, so be it. After a quick first pass with the tiller, spread a layer at least 2 inches deep, up to 6 inches deep, and till it into the ground as you work the tiller deeper. The great thing about organic material is that it improves all kinds of soil. With sandy soil you will see an improvement in water retention and nutrients, while in a clay soil the same material increases drainage and allows more air into the earth, speeding up nutrient release. For a hedge, prepare an area about 3 feet wide, and a circle of similar diameter for an individual tree. It is better to create a continuous bed of prepared soil for a hedge or screen, rather than just make individual spots for each plant. In average garden soil you don’t need to add other nutrients, but in poor soil it pays to use a starter fertilizer as well, raked into the ground after tilling it. When planting hedges and screens, the temptation is always to put the plants close together, to get instant coverage. This is a mistake, since crowded plants can’t develop properly, and will compete with each other. This easily results in some plants dying, and in all the plants growing tall but spindly. You won’t get the broad, dense hedge you are looking for, and the lower branches will soon die, leaving you with a collection of bare stems with leaves on the top. For Thuja Green Giant, allow at least 3 feet between each plant for a hedge, and up to 8 feet for a screen. This plant will become 12 feet wide in 10 or 15 years, so it will soon fill such relatively small spaces. By allowing enough space you keep the plants green and thick right to the ground, which is almost always what we want to see. Remember too to allow at least 3 feet back from a fence, wall or property line. You want to keep your trees on your side of that line, so they remain yours and don’t spread onto your neighbor’s land. When it comes to the actual planting procedure, remember to water the pots thoroughly the night before, and the ground too if it is dry. Never plant dry pots into dry soil. Dig holes into your prepared ground just a little wider than the pots, and the same depth. For a hedge, it is easier to get the spacing right if you take out a trench, rather than individual holes. That way you can line everything up, adjust the spacing to get it all even, and then plant – the result will be much better from the get-go. Once you have the holes dug, slide the plants out of the plastic pots. To encourage the roots to spread outwards, and to prevent future problems with roots circling around and strangling the trunk, you need to open up the root ball. The simplest way is to take a sharp knife and make three or four long cuts, from top to bottom, one-inch deep down the sides. If most of the roots seem concentrated at the bottom, instead make a cross-cut on the bottom of the root-ball, again about one-inch deep. This might sound drastic, but your plants will thank you for it in the years to come. Place the root-ball in the hole and adjust the depth so that the top is at the same level as it was in the pot. If your soil drains slowly, raise it up a couple of inches. In very poorly-draining soil, it is a good idea to build a low mound along the planting row, about 8 inches above the surrounding area, and plant onto that. This can really make a difference. Once you have the trees in place, replace about two-thirds of the soil, and firm it down around the root-ball. Then fill each hole to the top with water and wait for it to drain away. This is far better than watering after you plant, as the water is down around the roots where you want it. Once the water has drained away, replace the rest of the soil and firm it gently. Remove any tags, string or stakes, and rake the soil level. If you are planting in spring or summer, putting a mulch over the roots is a good way to conserve moisture and encourage growth. You can use some of the same material you added to the soil. A layer 2 inches deep, kept a few inches away from the stems and off the foliage, will do the trick. Renew this every spring, or every second spring. That’s it. You are done. Your plants of Thuja Green Giant are off to the perfect start. Now all you need to do is stand back and watch them grow. While Thuja Green Giant is widely grown for hedges and screening, and justifiably so, given its rapid growth-rate and dense, upright structure, the use of this plant in gardens shouldn’t stop there. Fast-growing evergreens have a wealth of uses, so it’s time to take a closer look at what can be done with this versatile plant to solve a variety of garden design issues. Let’s get started. There is something majestic and calming about a column of evergreen foliage. There is a range of plants that do this, but for many of them the wait is long until they become effective. Not with Thuja Green Giant. With proven growth of 3 feet a year in younger plants, it won’t be long at all until you have a bold green column making a statement in your garden. These fingers of green are ideal for adding a touch of geometry to your garden. Plant a pair on either side of your driveway, for example, or to flank a gate. Run an avenue beside a long driveway and bring a majestic feel to coming home. If you have a portico entrance, or large front doors, then it will look even more impressive framed by green columns on either side. Mark the corners of your patio with an upright exclamation point of green and add calming balance to your garden. These upright features are important in any garden, formal or informal, because they create a sense of structure. It is easy to plant a lot of trees and shrubs on your property, but you don’t want them to become just a forest. Thoughtfully-placed accents show that this is a garden, not just a collection of plants. If you have a large lawn, you might have planted several trees on it. The natural tendency is to use shade or flowering trees, and that is the way to go, but adding some upright evergreens creates a fully picture, and makes the trees look even more impressive. Another valuable place to put one or more specimens of Thuja Green Giant is in the corners of your property. These can be difficult spots to landscape well, but evergreens will create a more enclosed look that enhances the ‘garden’ feel. In small to medium-sized gardens, one will probably be enough in a corner, given that they will soon be 12 feet wide. But in larger gardens a group will most likely be needed. The rule for grouping plants is simple, and is taken from Asian gardens, where even numbers other than two are considered unlucky, and everything is done in odd numbers. It might be more a case of ‘look’ than ‘luck’, but anyway, this rule is a good one. If you plant a group of more than one, even two is rarely right, but three just looks so much better. For larger areas – and Thuja Green Giant can quickly fill even a large dead spot, go to five or even seven plants. The spacing between plants is critical to making groups work properly. The most common mistake is putting them too close. It just seems impossible that these compact little guys could even get so big they merge into a formless mass. They do – very quickly. While we exploit this for a hedge or screen, with groups of specimens we want an outcome that respects each plants individuality. You can reckon that in most gardens Thuja Green Giant will reach a spread of 12 feet. So plants spaced that far apart will take maybe twenty years to touch. When we stand back and look at a group of plants we see the upper part, and to create a group there has to be some unification. This means that 12-foot centers are going to be too far apart, at least for a very long time. 8 to 10 feet is usually the ideal spacing for this plant when forming a cluster. If you make groupings of more than three plants, plant one or two a little further apart – so in a group of five, three might be on 8-foot centers, and the remaining two on 10-foot. This might sound trifling, but it is on this attention to detail that distinctive gardens are created. If the plants begin to merge lower down, but remain as separate fingers up above, that is the ideal outcome. The goal is to look ‘natural’, so strict geometry is out – unless you are doing the Italian Renaissance in your garden. For that avenue mentioned earlier, the spacing needs to be more, so that each tree stays as a distinct individual. 20-foot centers would be a minimum, which means six pairs along a 100-foot driveway. “Wait – that can’t be right!” did you just say? Yes, it is – you need a pair at each end, and four pairs to divide the 100 feet evenly into twenty-foot intervals. Draw a diagram if you don’t believe it. Although usually planted directly in the ground, Thuja Green Giant is in fact a plant that is perfect to fill big tubs with low-maintenance green. Not only do they grow fast, but they stay naturally tight, although there is nothing wrong with clipping to get a more formal, conical shape from your plants. Since this is a large plant, bigger containers are needed. Half-barrels, or 24-inch planters, are the right size for trees that are going to be in those planters for a long time. Make sure they have large drainage holes, and try to source potting soil for outdoor planters, not houseplants. These soils contain composted bark or other coarser materials that don’t break down quickly, so the soil is more resistant to rain, and continues to drain well. A spring application of a slow-release fertilizer for evergreens is all it takes to keep your trees growing well. Thuja Green Giant is relatively drought resistant, so established plants in pots take a while to suffer if you don’t water, but it is best not to let that happen. Once the top few inches are dry, give them a deep soak until water flows from the drainage holes. Then leave them to become dryer again before re-watering. This is necessary to prevent root diseases. These tubs can be placed on a terrace, around a pool, in the corners of a parking area, or just about anywhere you have paved surfaces. The benefit of evergreens is that they don’t start dropping leaves each fall, or flower petals either, so maintenance of the area is not impacted significantly. However you use Thuja Green Giant around your garden, you will be amazed at the versatility and adaptability of this plant, and how easily it brings structure and form to any garden. Hedges are not the end of the uses for this plant – they are just the beginning. Planting a hedge or screen is an investment – not just in money, but in time and effort. You wouldn’t make a financial investment without planning, and the same goes for planting too. While there are other important things, like soil preparation, correct planting techniques, after-care and good trimming, all of these count for nothing if the basic step of spacing has been neglected. Plant too close and your hedge will become thin at the bottom, with plants dying out as the strongest win in a battle for survival. Plant too far apart and you will first be waiting for ever for it to fill in, and always have an uneven face, with ins and outs, instead of that perfect flat surface that is the sign of a good hedge. So let’s consider how to space your plants correctly, thinking especially of that most popular evergreen of all for hedges and screens – Thuja Green Giant. Remember to add room for the width too. 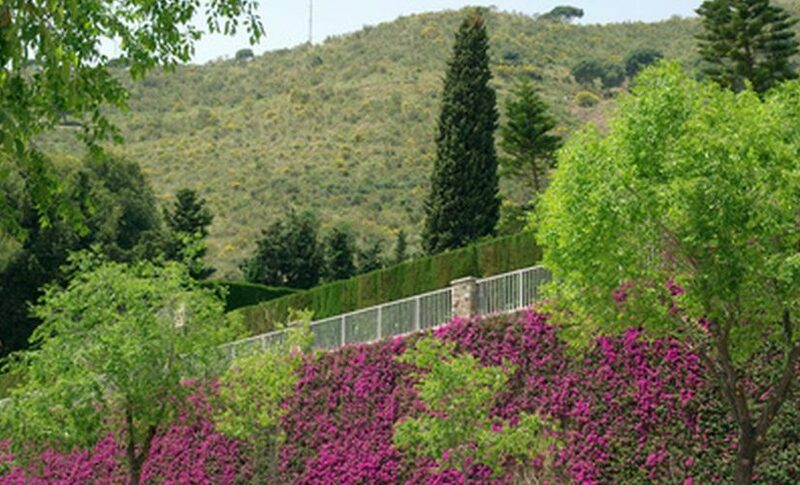 Hedges are based on planting close, so that the trees grow together into a continuous mass. But you have to be careful. Sometimes it is recommended to plant root-ball to root-ball, that is, to pack the plants into a trench with the roots touching. Not only does this take a lot of plants, it results in a poor hedge. It does push the plants into growing tall, so you get the height you want quickly. This is probably where the idea came from, and for a few years it can look great, with a nice dense hedge. But after a few more years you will start to see problems. First, some plants will die, as the ones that were a bit more vigorous to start with begin to take over. You will suddenly see plants turning brown, and the foliage falling to the ground. 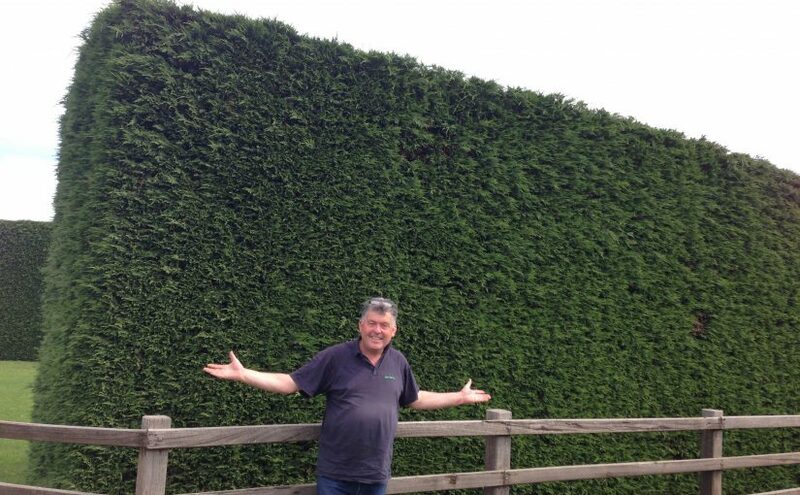 Once they become bare you need to remove them, leaving gaps in your hedge – never what you wanted! Over time the spaces may fill in from the surrounding plants, but until that happens you have a really ugly hedge. Even if you don’t get gaps, pretty soon the lower parts of the hedge stop growing, and it thins out just where you want it to be thick and green. Eventually the lowest branches begin to die, and your hedge loses that ‘green to the ground’ look that is so desirable. Much better is to allow enough room for each plant to develop, while keeping them close enough that in a few years they merge into a solid wall. How close is that? If of course varies with the plant you are using. As a rule-of-thumb, check out the mature width of the plant. Taking Thuja Green Giant as an example, the mature width is 12 feet. So take 25-35% of that, and we have 3 or 4 feet. That is the ideal spacing. It’s that simple. The closer spacing will give you a solid hedge sooner, and the wider spacing will save you money by reducing the number of trees you need, but take a little longer to look full. The basic difference between a hedge and a screen is how often you clip it. Screening plants are rarely clipped, or not clipped at all. You might give them a trim or two as they develop, to build denser structure, and then a ‘touch up’ every few years, but that is about it. A hedge is going to be clipped at least once a year, and usually two or even three times, depending on how neat you are, and how much time you have. Especially in warmer areas, plants have a long growing season, so they will need more trimming. With a screen, we want the plants to grow out naturally until they touch, so in theory we could plant at the same distance as their mature width, but that will take too long, so we usually go closer. Don’t go too close, as the plants will be pushed to grow tall, but stay thinner, which is a recipe for structural weakness as the screen gets taller. So half the mature width is a minimum, which in the case of Thuja Green Giant is around 6 feet. Again, if you are in a hurry you could reduce that to 5 feet, but don’t go any closer. You could stretch it to 8 or even 10 feet to reduce the cost, but if you need a visual barrier that will take a while at such a wide spacing. If you have plenty of room available, and you want a really solid barrier – perhaps for sound protection for example, then a double row is the way to go. This can be done for a hedge or a screen, and the method is to plant in two rows, at a wider spacing, with each plant staggered, so that the plants in one row sit in the spaces between the plants of the other row. Even though the spacing is increased, this method does take more plants, but if a really solid barrier is your goal, then double rows are the way to go. 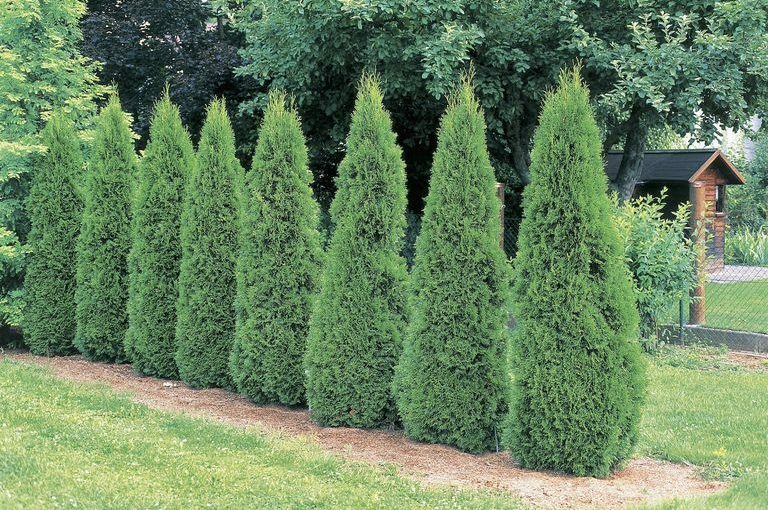 For Thuja Green Giant, space the rows 3 feet apart for a clipped hedge, and 5 feet apart for an informal screen. In each row, a wider spacing of between 5 and 8 feet is good for a hedge, and 8 to 12 feet for a screen. Planting double rows properly requires careful measuring and lay-out, otherwise you will lose the staggered effect. Careful layout is always needed really – that hedge or screen will be there a long time, and any spacing irregularities will glare at you for years to come! It is worth making allowances for poor soil conditions too. Rocky or sandy soil, especially if it is often dry, will reduce the growth of any plant, so you need to compensate for that by planting tighter. Reducing all the above spacings by 20 – 25% will do it, and give you something solid, even under poor conditions. A common mistake of inexperienced gardeners is to plant a screen or hedge right on the property line, or in a space too narrow for the plants. If your hedge impinges on neighboring property, they can cut it right back to the property line, so plant well inside it. Plant 6 feet inside for a large plant like Thuja Green Giant, or a little less for something narrower. That way all the plant will be on your property, and under your protection. Similarly, when planning a hedge, especially along a path or driveway, set the back by 3 feet for a hedge and 5 feet for a screen, when using a large plant like Thuja Green Giant. Smaller plants will need a little less, but you don’t want your path to disappear in a few years – working with small plants can be deceptive, so do plenty of measuring! A lot of the focus with caring for Thuja Green Giant is on the actual planting and establishment of new plants. This is important, because good establishment means durable plantings and a long life for your bushes. But after a few years your hedge, screen or specimen plants will be established in your garden, and questions come up about caring for these older plants. So in this blog we are going to focus on that – what special care and steps are best for older plants, particularly so that they go on to have a long, healthy life, and continue to play their vital role in your garden for years and decades to come. It is obvious that newly-planted bushes need extra water until they settle in and send out their roots into the surrounding earth. But how long should this go on? What should we do for established plants if a long drought period arrives? You should continue with watering new plantings throughout their first growing season. So if you planted in spring or early summer, it is best to water deeply once a week until the cold weather arrives, and winter rain or snow takes over. In the following year you should only need to water if there is a drought of three weeks, but if you have very sandy soil it pays to water regularly – perhaps every two weeks, for that second season. In later years you only need to think about watering if there has been no rain for a least a month, and in many soils your Thuja Green Giant plants will be unaffected by drought periods much longer than that. The critical season for watering established plants is spring, not summer. Spring is when the major growth push takes place, and that is when the plants need plenty of water. 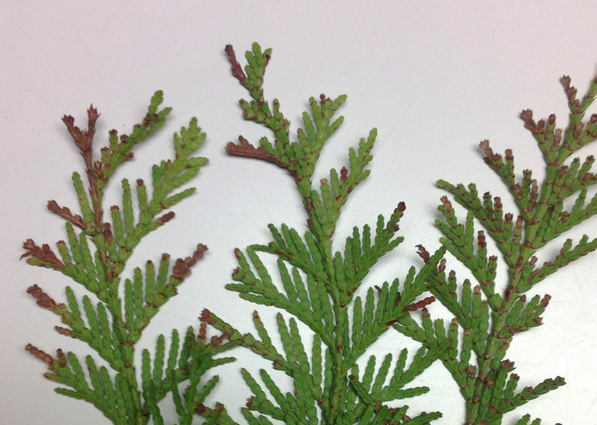 So a spring drought can be damaging – although probably not fata – even to established plants. The new growth will be reduced, it will be thinner and not so green, and repeated over several years, the result will be a thinner plant. So if the weather turns dry in spring, as it so often can, a thorough soaking of your established plants will make sure they perform at their peak best. Mulching also helps, and with hedges and screens leaving at least some of the clippings under the hedge is the easiest way to create a natural mulch for your plants. That layer of dead leaves will conserve moisture by reducing evaporation from the soil surface, as well as inhibiting weed growth. If you keep your hedge green right to the ground, then those clippings won’t show, and you save time by just blowing or brushing them underneath, instead of having to collect them up. Young plants always perform best with a regular fertilizer program, but after a few years it can become less important. If your natural soil is a loam or clay soil, it will almost certainly have good natural levels of plant nutrients, and most plants will grow well in it without any assistance. If you have a sandier soil this is not true, and if that sounds like your soil situation, a fertilizer program should be kept up indefinitely. For established plants granular fertilizers, and slow-release fertilizer are best. These require fewer applications a year, and slow-release forms usually need just one spring application, saving you a lot of gardening time. Compare that to liquid fertilizers, which need applying every two to four weeks throughout the growing season – this can become a real chore, especially over the years. It is usually best to keep up annual fertilizer application even if you have good soil, when growing a hedge of Thuja Green Giant. Trimming removes nutrients that would naturally be re-cycled within the plant, so these need to be replaced for optimum growth. This is also another good reason to spread your clippings underneath your hedge, rather than throwing them away, as their gradual decay will eventually return the nutrients in them to the roots. Evergreen clippings are generally not good in a compost heap, so leaving them in place is the best and easiest way to dispose of them. In summary, keep fertilizing your evergreens indefinitely if you trim them more than once a year or more, and in all situations if your soil is sandy. For plants left to grow naturally, keeping up fertilizer application is less important on most soils. If you have Thuja Green Giant, you probably decided when planting if you were going to trim them or not. Some people do underestimate the final size of this big plant, and trimming can become a necessity. If you suddenly see that your plants are too big, don’t rush out and cut them back hard. Like most evergreens, you cannot cut a branch back below where it has green shoots, and have it sprout back. If you get carried away and trim too hard you may destroy your hedge. If it really has become way too big, take back as much as you can, being sure to leave some green growth on every branch. After a year or so it will thicken up, and you can usually go back and get it even smaller than the first time. Better to take your time than destroy those old, established plants. Even better is to anticipate a plant that is about to become too big, and trim it before, not after, that happens. It is much easier that way, and you will never have to trim so hard that your plants look bad for months, before filling out again. With a hedge you should have trimmed regularly from an early age, but as your hedge matures it pays to anticipate problems. Keep those sides sloping inwards a little, so that the lower part stays green and thick, and if you live in an area with snow or ice storms, round off the top, keeping it as thin as you can, or the accumulation of ice and snow will break the top and open your hedge out. Watch for sections that seem to be yellowing, as branches can sometimes die back naturally. If you see this beginning, trim back those weak areas while they are still green, so that the surrounding foliage can spread into them. That way, if and when the weak branch dies completely, you will have a much smaller gap to fill in, and you will avoid the eye-sore of a gaping hole for several years. Sometimes too, trimming back an area that is weak will rejuvenate it. Thuja Green Giant will live for many years, stretching into decades, and it can be maintained as a screen or hedge more or less indefinitely. The secret is to adjust your care techniques as they age, so you avoid problems down the road. Screening is often high on the list of garden projects for many people, especially if you live in a built-up area. Evergreen screening is an effective and low-cost way to screen out unwanted noise, an ugly view, or neighbors, especially if you need screening above 6 feet. Tall fences are expensive, difficult to erect, and are often prohibited by city by-laws, but planting is not. You can put in screening plants that will grow pretty much as tall as you want, and a popular choice for that is Thuja Green Giant. There are lots of good reasons for this – perhaps the most obvious is the rate of growth – so let’s consider this choice in more detail, to see if it’s the right one for you. Thuja Green Giant will grow, if unclipped, to a height of about 30 feet, and while that might take 30 years, it will be half that height in as little as 10 or 12 years. The bigger trees get, especially in a long screen, the more difficult and expensive it is to trim them, so the first thing to think about is the effect of planting a green wall, 20 feet or more in height? What about light into your home and garden? That will depend a lot on how close to your home the screen is going to be, and of course whether it is to the north or south, or some other compass position. Tall plantings to the north side will not cast a shadow, while in other positions it will. Consider too that the shadow will be longest in winter, because the sun is lower in the sky, and that may be just when you want that extra light. Remember too that Thuja Green Giant will be up to 12 feet wide in time, again if left untrimmed, so consider how much ground space that is going to take up. Depending on your particular situation you could trim up the lower several feet, as they grow, creating trunks on your screen, which will free up ground-level space, but even then you should plant 6 feet or more from your property line, so that the trees are actually ‘yours’ completely. For many medium to large-sized gardens, that kind of space is not an issue, but in a smaller garden you might want to consider something smaller, such as Emerald Green Arborvitae, which only grows to about 12 feet tall. It is hardy all the way from zone 2 to zone 7, making it the perfect choice for a smaller screen in colder areas. 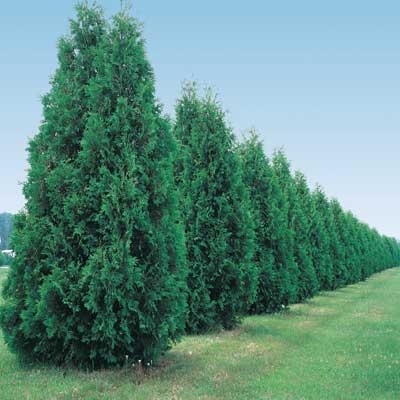 Here we get into the reason for the enormous popularity of Thuja Green Giant – its growth rate. Young plants can add 3 feet a year – and even more sometimes. As they mature the growth does slow down, but still exceeds a foot a year. This can be seen with the original planting, where a plant at the National Arboretum in Washington reached 30 feet in 25 years. Tiny plants have been proven in trials to reach 10 feet in 7 years, faster than any other evergreen around. Good soil preparation and a regular fertilizer program will give your plants the best start and the quickest growth rate, so go that extra distance and reap the rewards. How Far Apart should I Plant? Given how big Thuja Green Giant gets, you don’t need a lot of plants to make a screen. Depending on how quickly you want that screen to develop fully, you should plant 5 feet apart for a quick screen, and as much as 10 feet apart for something less solid, that will give the effect of screening without making a solid wall of green. If you do want solid, and you have enough room, then plant a double row. Allow 5 feet between the rows, and plant 8 feet apart in each row for a quicker screen, or up to 12 feet apart for something looser. Stagger the planting in each row, so that one plant stands in the middle of the gap in the other row, creating a tight zig-zag. Since Thuja Green Giant is not eaten by deer – at least not usually – and has no significant pests or diseases, there is nothing to do in that direction. The most important care is watering during the first growing season, which should be once a week. Don’t rely on showers or thunderstorms, as most of that water only wets the top inch or two in summer. 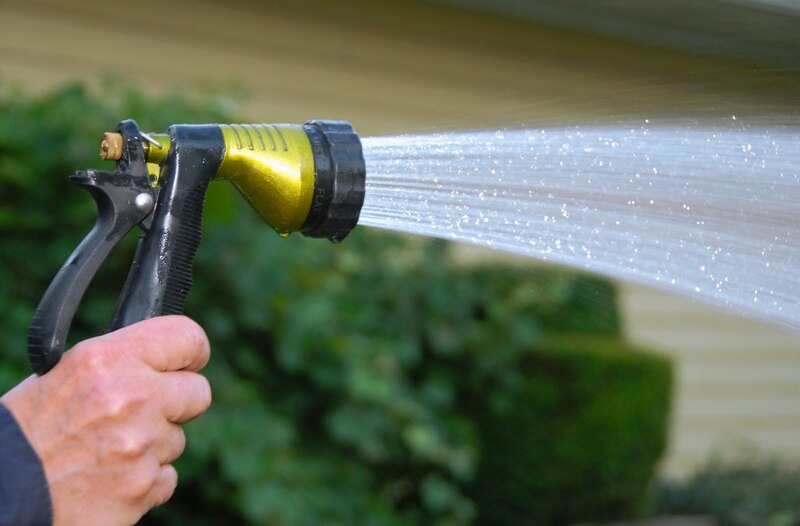 Instead go for a deep soak from a gently-running hose on each plant, or by installing trickle pipe along the line. 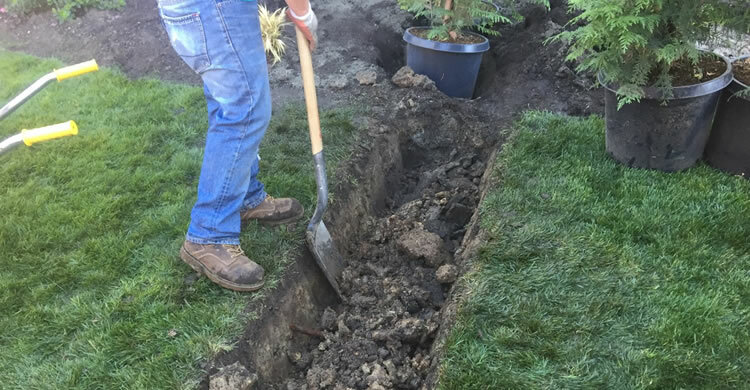 It’s important to keep the soil further away from each tree moist too, because you want to encourage the roots to grow outwards into a large volume of soil. That will happen much more if the ground around is temptingly moist, rather than dry. After that vital first year you don’t need to give so much attention to your trees. Watch for dry periods in the second and third years and give those deep soaks again if the soil is dry below the top few inches. A quick dig around with a spade will show you that – just turn up a few inches of soil and feel for moisture. Increased watering during the early years will also accelerate growth, especially if combined with a fertilizer program. In the early years liquid fertilizer is best – it gets straight to the roots and is taken up quickly. Feed each month for the best results, and that can be a little time-consuming, so after two or three years switch to slow-release granular fertilizers that only need one application a year, in spring. Choose a blend suitable for evergreens and look for Iron and Magnesium in the added micronutrients listed on the label. They will keep your screen a rich green color all year round. Thuja Green Giant produces a dense plant without trimming, but as the early growth is fast and so more open, a light trim each year while the plants are small enough to reach will make it thicker much more quickly. You only need to take off an inch or two, so it has no real effect on the size or rate of growth, but it certainly makes for a dense screen early on. 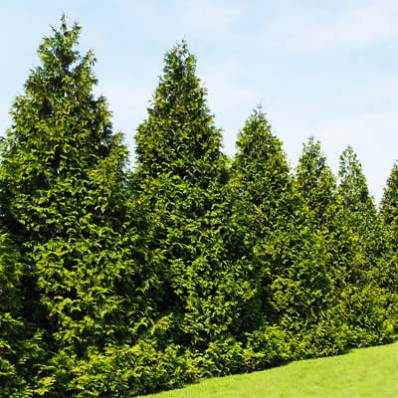 Thuja Green Giant is the number one choice across much of the country, and it is probably the best choice for you too, but it pays to think it through first. Hopefully these notes will help you reach the right decision. Hedge trimming season is well underway across the country, and after the rush of spring growth, if you haven’t trimmed your hedges yet, or if you did it a while back, now is the perfect time to do it. There is no doubt that the best way to have good hedges is to trim regularly, and the more you cut, the denser your hedges become. Everyone loves the look of freshly-trimmed hedges, so here are some tips on how to achieve that perfect look and keep your hedges healthy too. That look of a smooth, green hedge is the result of clean cuts to the foliage. Ragged cuts turn brown, so your whole hedge looks brown and dull. Blunt trimmers – hand or power – are the most common cause of poor results, and they also slow you down, meaning multiple passes are needed, where a sharp trimmer would cut in one go. Although it’s possible to sharpen them yourself, most of us choose to have a professional do it. Have your trimmers sharpened before the first cut of the season, and if you have a lot of trimming, or do it frequently, you might need a second sharpen in the middle of the season. Trimmers come in many sizes, and the most common error is using a short bar for a large hedge. A long bar not only speeds up trimming, it makes it so much easier to achieve a flat surface. As well, decide what power-source to us. There is a big move today towards cordless electric, and with the new, lighter, quick-charging batteries, it makes a lot of sense. Freed from the hanging cord, and not surrounded by gasoline fumes, trimming becomes a much more pleasant experience. The result? You are more likely to trim more frequently, with improved results. The more often you trim, the denser and more durable your hedge will be. This is especially important with a young hedge – more on this later – but even for a mature hedge trimming twice a year, rather than the more common annual trim, makes an enormous difference. Three trims per year will really give you that top-quality look, if you can find the time. The biggest mistake of a beginner when trimming their hedges is to run the trimmer in just one direction – usually upwards. This seems to be ‘natural’, but it causes long-term problems. You end up with a hedge that consists of long, upright branches, with foliage on the outside only. These easily break under snow or in strong winds, leaving big gaps that are hard to fill. A much better technique is to trim in all directions from day one. Upwards, downwards, and sideways too. By doing this you build a hedge with many more-or-less horizontal branches, with dense, twiggy ends that make the face of the hedge. They can’t be dislodged from the hedge, so it is so much stronger, and if one dies, it only leaves a small hole, that rapidly fills in from the surrounding branches. To keep the lower part of your hedge healthy and green, it needs light, and it needs reduced competition from higher up. So your hedge should always be wider at the bottom than the top. Light reaches right down, and the bottom gets its share of food and nutrients. If you let the top grow fat the bottom will soon die, leaving you with a hedge that is full of gaps just where you see it most. A lot of people wait until their new hedge plants reach the final size they have in mind – 8 feet tall for example, and only then begin to trim. If you do this you will always have a thin hedge, because there will be too few branches available to make that solid face. So begin early – as soon as you start to see new growth after planting – and trim an inch or two from the top and upper sides regularly. Don’t be afraid this will slow down growth significantly. It won’t, and your hedge will be so much better for it. Another good reason to trim regularly is because hard cutting of most conifer evergreens doesn’t work. If you trim a branch below the point where it has green foliage, it won’t re-sprout at all and that branch will never grow again. Some plants are an exception to this, particularly yew trees, which will come back happily even from thick branches. But for cedar and cypress you can only remove a certain amount of growth – that why it can be better to replace a badly overgrown hedge, rather than attempt to salvage it. Regular trimming removes green foliage, so to produce more your hedge plants have to grow more leaves. To do this quickly, and remain vigorous year after year, it pays to have a regular fertilizer program that you follow pretty closely. Use a method that suits your hedge – liquid feed when young, granular when older. Slow-release forms cost more but they save a lot of time, since most only need to be applied once a year. Choose a quality blend that is designed specifically for evergreen hedges, as it has the right balance of nutrients. Trimming during drought periods can be risky, as the sudden exposure of all those cut edges can cause desiccation and die-back. But sometimes we just have to do a job when we have the time to do it, and a long delay may leave hedges ragged and untidy. So if you have to trim when the ground is very dry, soak your hedge a couple of days before hand, so that the foliage is full of water. It will trim better too. After all that, you want to come down from that ladder in one piece. So wear gloves to protect your hands, a hard-hat if you are up a ladder to any significant height. 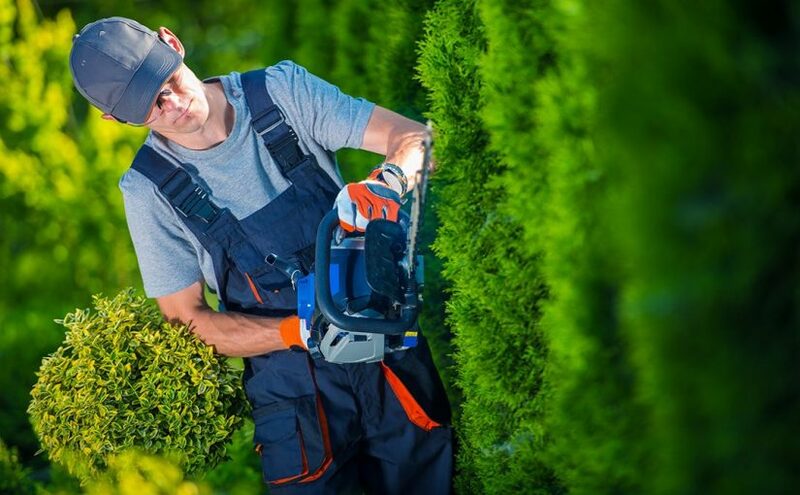 Make sure you have trimmers that have up-to-date safety features that protect you from injury, and if the weather is hot, make sure you stay hydrated.